If Effigia is so theropod-like, how do we know that it’s a crurotarsan? Well, there are still some giveaways. The tiny hands are characteristically crocodyliform-like, the ankle is of the complex crocodile-normal type, the way the femur articulates with the pelvis is not like that of dinosaurs, and there are other crurotarsan features too. Nesbitt & Norell included Effigia, and theropods and other taxa, in a modified version of Mike Benton’s basal archosaur data set, and Effigia is consistently recovered as a suchian within a rauisuchian clade that also includes Arizonasaurus and the bizarre fin-backed Lotosaurus. It now seems quite secure that Shuvosaurus, based on a skull described by Sankar Chatterjee (1993) as ornithomimosaurian, is a close relative of Effigia, so so much for Oli Rauhut’s contention (Rauhut 1997, 2003) that it’s actually a bizarre coelophysoid. I confess to actually liking Oli’s idea, and an interesting consequence of it is that his inclusion of Shuvosaurus within his phylogenetic analysis of Coelophysoidea ‘forced’ Dilophosaurus away from coelophysids and closer to tetanurans. As I noted when I reviewed this work (Naish 2003), given that his topology was dependent on his inclusion of Shuvosaurus, it’s especially interesting that other people later found the same topology, but without incorporating this problematical taxon. But then, different data doesn’t necessarily = different trees, and now it’s clear that it was a mistake to get so excited about Shuvosaurus as a theropod in the first place. Ah, the benefits of hindsight. So, ‘crurotarsans did it first’, evolving gracile, vaguely ostrich-like body-plans long before theropods did. Amazing. And scary, because, while we can confidently allocate Effigia to Crurotarsi now that we have semi-complete specimens, we couldn’t have done this if we only had scraps. So this is where it becomes especially relevant for me. Dave and I spent pretty much ALL day working on our British dinosaurs article, and I’ve also spent the last several hours chasing up various details. I spent the last several days working on it, and (in between parenting) I think I’m going to be spending the next several days on it as well. In the British fossil record we have a reasonable number of bits that have been identified as coelophysoid. Now, some of them (like a partial pelvis and femur from Pant-y-ffynnon Quarry in south Wales, and the holotype of Sarcosaurus woodi, from Barrow-on-Soar) are based on remains that look securely theropod. But so many others are based on crappy fragments. Are these bits still from coelophysoids? Or might they really be from Effigia-like crurotarsans? Well, that’s the problem, and I bet loads of palaeontologists are now thinking anew about isolated Triassic elements previously assumed to belong to this group. Such is the nature of discovery. 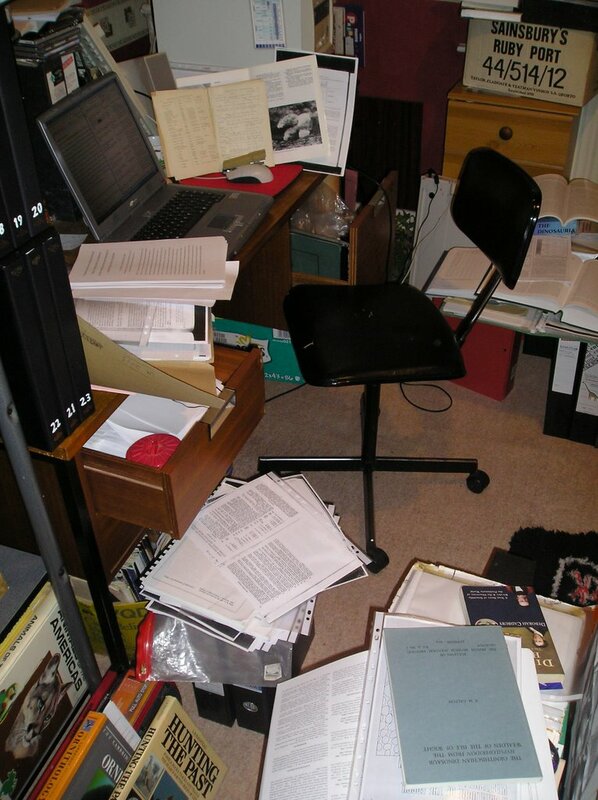 So all I can go is go back to my bomb-site office (as seen in photo above), bury myself once more in those piles of antiquarian literature, and hope and pray that no-one else comes up with a novel reidentification of a group supposedly represented by lots of scrappy British fossils. Chatterjee, S. 1993. Shuvosaurus, a new theropod. National Geographic Research & Exploration 9, 274-285. Naish, D. 2003. [Review of] The Interrelationships and Evolution of Basal Theropod Dinosaurs. Geological Magazine 140, 729. Rauhut, O. W. M. 1997. On the cranial anatomy of Shuvosaurus inexpectatus (Dinosauria: Theropoda). In Sachs, S., Rauhut, O. W. M. & Weigert, A. (eds) 1. Treffen der deutschsprachigen Palaeoherpetologen, Dusseldorf, 21.-23.02.1997; Extended Abstracts. Terra Nostra 7/97, pp. 17-21. - . 2003. The interrelationships and evolution of basal theropod dinosaurs. Special Papers in Palaeontology 69, 1-213. Darren, one should think you really out to just get your thesis completed and done with :). You can worry about revision for the publication of the parts!